How to decorate your Victorian Christmas tree. Featuring a variety of holiday themes including red & white trees and trees with icicles. 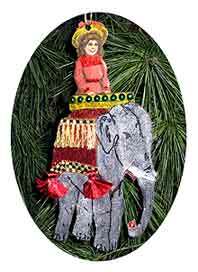 Create the magic of a Victorian Christmas tree. The trees, brought from the mountain and hillsides, were of all sizes, from two feet high to a majestic height that could graze the lofty ceilings in homes of the wealthy. Stars, wreaths, and ropes of evergreen adorn the interior of homes each holiday season. Find charming evergreen portieres that adds holiday cheer to any size room. The beginning of an annual tradition began in the 1870s at Macy's. 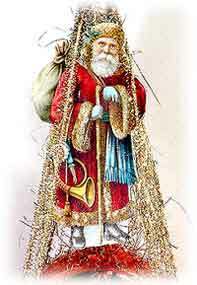 Follow the directions from an 1867 Harpers Bazaar to make a truly Victorian Santa Claus. The story of a company dedicated to recreating the wonder of a Victorian Christmas. This design is from an 1890s issue of Arthur's Home Magazine. 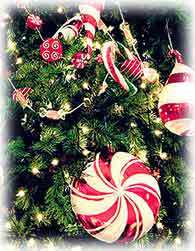 The first artificial Christmas trees were small tabletop trees made of goose feathers. Christmas trees were lit with burning wax candles attached to the tree. The history of the Victorian Christmas tree in the 19th century. Queen Victoria and Prince Albert are closely associated with Christmas traditions at Windsor Castle. Artificial holiday trees come in a variety of shapes and colors since the 1800s. A miniature landscape arranged at the foot of the Christmas tree. Vintage advertisement for Christmas Kewpie designs. Queen Victoria and her family gathered around the Christmas tree at Windsor Castle in 1848.